Composite decking is the fastest growing wood deck alternative on the market. It can be incredibly low maintenance and last even longer than traditional timber decking thanks to its durability and imperviousness to rot. Composite decking is a man made building product and with recent advancements in production you have the choice of many exotic woods previously not available to you. This is due to the way recycled plastic and wood fibres are combined to create natural looking colour schemes that mimic the real thing. Meaning you can completely tailor your outdoor decking solution to suit you house and landscaping. 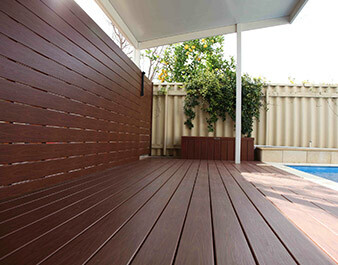 If you’re in the market for a deck in Perth that is low maintenance, composite decking could be the way to go. It doesn’t need to be stained, sealed, or sanded like traditional timber decks. Because of this, composite decks are often found to be cheaper than timber over their product life. You also don’t have to worry about nasty splinters when cleaning composite decking. By investing in composite decking you could produce a substantial return in the future, but even if that’s not a factor affecting your decking choice, by choosing composite decking you are ensuring your deck is a beautiful space for family and friends to gather for years to come. 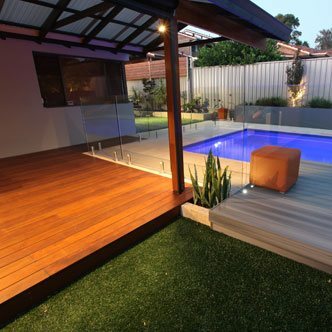 Composite decking is a safe and reliable option that can be used in both wet and dry areas. It has amazing structural integrity and will have your outdoor area looking refreshed and amazing in no time. 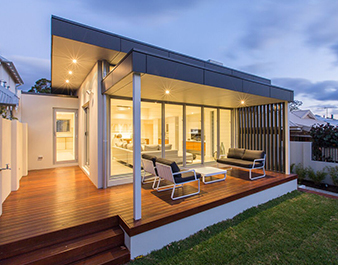 Sustain Patios and Outdoors are the experts when it comes to composite decking in Perth. Our eye for creativity means we can help you select the perfect variety and colour composite decking for your space, for a functional and beautiful result. 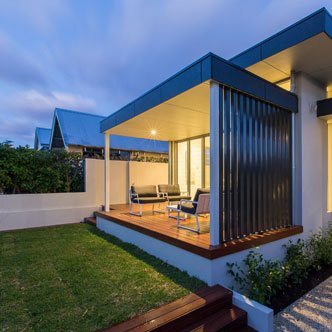 We can take care of everything from ordering to installation, so all you need to do is sit back, relax, and enjoy the best new composite deck Perth has to offer. At Sustain, we understand that each property has its own characteristics and each client has their own needs. That’s why no two of our outdoor solutions are the same. Our experienced and professional team will walk you through all of your options and help your choose the best one for your property. From the right Stratco Patio to a completely custom landscape design, we’ve got you covered. We do all the heavy lifting and incorporate any ideas or inspiration you’ve come across into your custom design. This way, you are left with an amazing outdoor area that compliments your home and your family’s lifestyle. 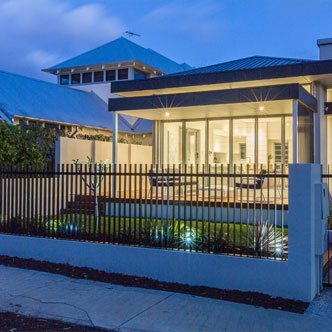 Customisation isn’t reserved for a full-scale backyard makeover; we customise even the simplest fences, gates, patios, and decks, to ensure they integrate seamlessly with your home. 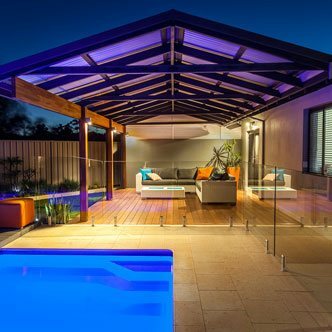 We are a West Australian owned and operated business which takes pride in understanding our clients needs, and providing them with stylish outdoor solutions that won’t break the bank. 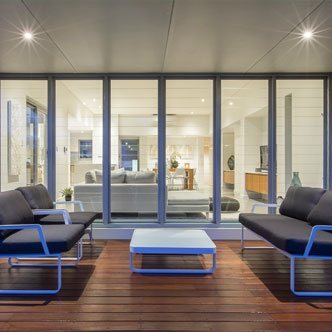 Sustain knows how to design and install a patio that will get you the most out of your Perth home because we’re local, just like you. We will keep you informed every step of the way and are always available for a chat about your project. Our professional tradespeople take pride in there work, and there are no pushy sales reps at Sustain, just honest advice and quality service. Our versatile patio solutions are just the beginning at Sustain; we offer full service landscaping and decking as well, so you can transform your entire outdoor area through our professional and highly skilled team. 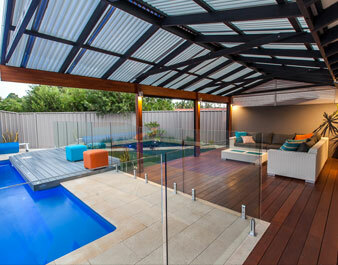 At Sustain we are passionate about creating and are on the cutting edge of patios, landscaping, and decking in Perth. Our highly skilled team will craft the perfect custom design for your home, with features tailored to your family and their needs. Being creative and working with innovative techniques can be surprisingly affordable and with Sustain’s efficient team, you can be sure costs won’t blow out. From the simplest of patios built to serve their purpose, to stunning holistically designed landscapes including fencing, and decking, Sustain takes pride in the outdoor areas we create and the service we provide to our customers. When it comes to efficiency and customer satisfaction, experience counts for everything, and we’ve got 25 years of it. We combine this invaluable experience with our unique to creative abilities to deliver the most professional and satisfying service in the industry. 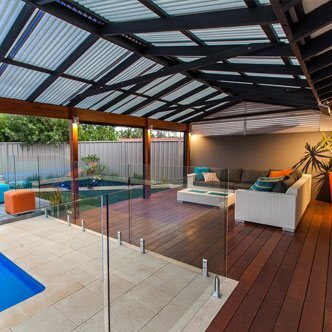 Collaborating with a business that has so much experience in the Perth patio, decking, fencing, and landscape industry ensures you’re getting the most accurate expert advice available. We have the tools and skills to execute any project with minimal disruption to your daily routine without compromising on quality. At Sustain Patios and Outdoors, we strive for excellence in all aspects of our service. From the moment you request a quote form Sustain you will experience the superior customer service we offer. Our staff offers helpful, honest advice about which patio or other outdoor solution would best satisfy your needs. There are no sales pitches or favoring certain styles, we solely focus on how to best produce your dream outdoor living area. During the designing and construction phases, our staff will be on hand to answer any questions you may have while our highly skilled tradespeople and installers work hard to complete your project. We are committed to completing projects on time and on budget, without compromising on quality. The building materials we use are also of the highest quality. Our attention to detail is second to none, and we will never turned a blind eye to compromised quality. Copyright @ 2017 Website by Tradesign, Digital Marketing by Doyle Digital.